My Time Made Easy Release Day! Finally the day is here! 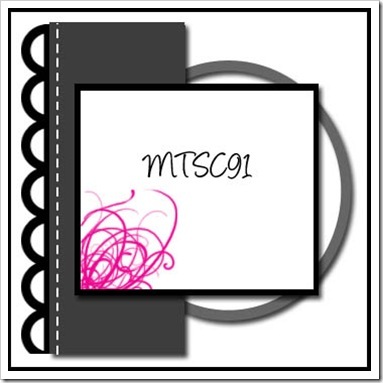 You can start ordering all the new fabulous templates, stamps, digital paper, and cut files from My Time Made Easy! The Design Team is out in full force today to unveil the new template called In Suspense. 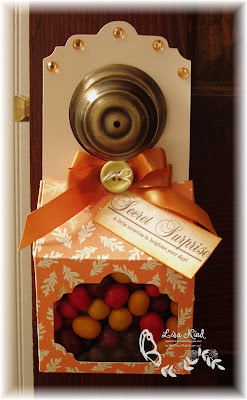 It's a cute little template designed to be hung from a door knob! Genius! 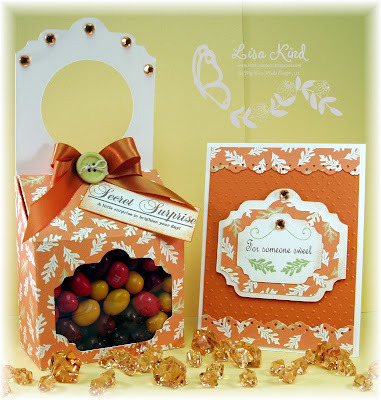 I started with the new and oh so beautiful Autumn Leaves digital paper in Pumpkin, and printed it on ivory cardstock. Isn't it just stunning? Love this paper. I didn't really add much more to this template than the bow and crystals. The opening of the template is covered with a piece of clear acrylic from a box I had. 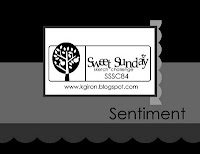 I stamped the sentiments from the new stamp sets A Secret Surprise and Thankful for my tag. 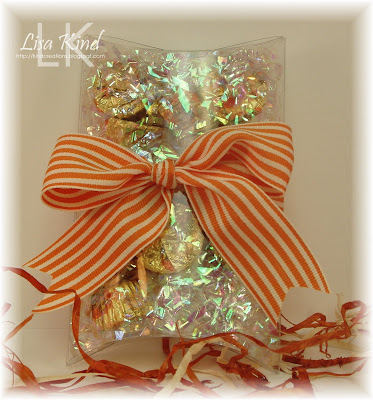 I filled it with peanut M & Ms and I'm eating them as I write this! Oy!! 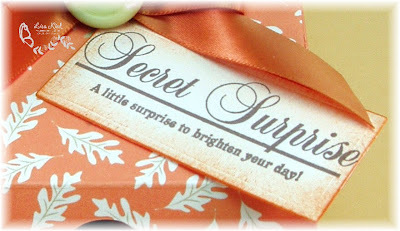 There are several different sentiments in A Secret Surprise stamp set that are perfect for any surprise. For the card, I used the Secret Surprise Label cut file for the largest label, then I reduced it to 65% (using the SCAL program) for the smallest one. The label cut from the digital paper is actually the negative piece from the opening of the template. 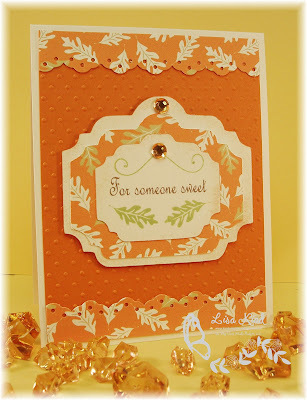 The sentiment is from the previously released On Display 1 stamp set and the leaves and vines are from the new Thankful stamp set. The scallop pieces are left over pieces from the template. Love that! And here it is in it's rightful place...hanging on a door knob! So fun! 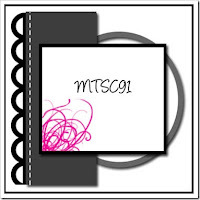 I've peeked at a few things that the DT have posted in the MTME Gallery, and they are so fun too! Stop by and see what they have to share and stop in the Gallery to see all the DT creations posted there. Here are links to their blogs. Thanks for stopping in today! My Time Made Easy Peeks Begin! Hi everyone! There is some great news coming from the My Time Made Easy camp! If you've been following Lauren's blog, you know that her daughter Alexa was hospitalized with pnemonia. (Actually, Lauren was diagnosed with it too!) She was in the hospital for about a week, and they were fearful that it was going to be a much longer stay. Well, she posted today that they are home and Alexa will be celebrating her 11th birthday today at home with her family! Lauren also has some other good news, so please stop by and check out this post. Lauren also came home just in time for the October release! Today the peeks begin and myself and a few of the other girls have some fab stuff to share with you. 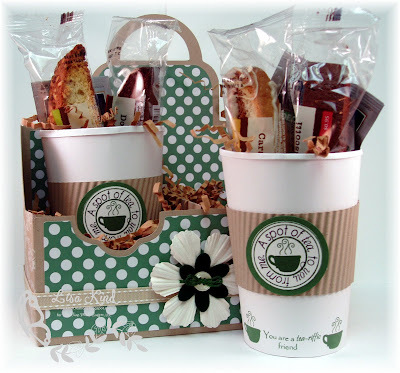 This new release is going to be loved by all you coffee/tea/hot chocolate drinkers out there! I'm a tea drinker (HATE coffee! 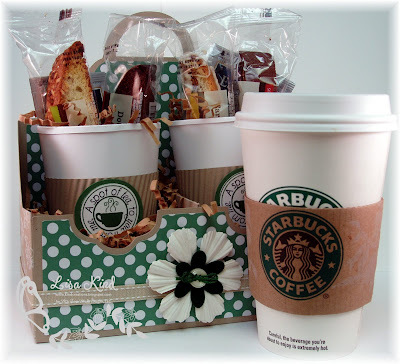 ), and I love Starbuck's chai tea latte. I only get them about once a week because I just don't want/need all the calories! 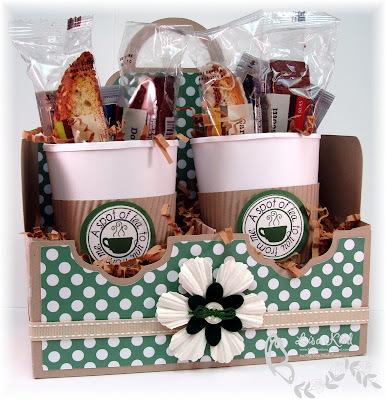 But I do love it, so I used the Starbucks cup and packaging as my inspiration. So what I have to share is the new Fancy a Cuppa? and To Go! templates and coordinating stamp sets. Leave it to Lauren to create something so cute, right? The cup is just amazing! When I sat down to plan what I was going to do, I just had to run out to Starbucks to get my chai tea latte (and some biscotti, which I always get along with my chai tea!) so I knew the colors and such that I had to work with. Pretty close, huh? If you look on the sleeve on the Starbucks cup, you'll see there is a sort of white flourish. I didn't have the Fanciful Flourish set from MTME, but I did have a floral design from So Sentimental that I stamped on the sides of the Fancy a Cuppa? template. I just stamped it with Ranger's Snow Cap white pigment ink. Loved the look! I went looking through the many wonderful digital papers at the MTME store, but couldn't find one in this green, so I called up my DT friend, Kristin (who just so happens to be one of the digital paper designers), and asked her if she could do a dotted paper in this green. She had it done and emailed to me within minutes! I guess it pays to have friends in high places! LOL!!! This will be part of another set of digital papers out soon, I believe. 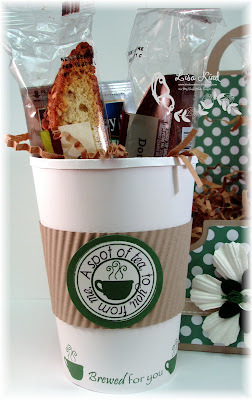 When I was decorating the cups, I looked at the original Starbucks cup. It had all sorts of writing on it, but what caught my eye was the writing on the bottom. So I decided to use two of the sentiments from the new stamp set called Grab a Cuppa Sentiments and the cup image from the new Fancy a Cuppa? stamp set. To decorate the sleeve (which is part of the To Go! template), I stamped the circular lines in green and the sentiment in black (there are seven circular sentiments in this set). These images are from the Fancy a Cuppa? Add On stamp set. I just punched it with a circle punch and mounted it on a green circle. I ran the sleeve through my crimper for a more realistic look. 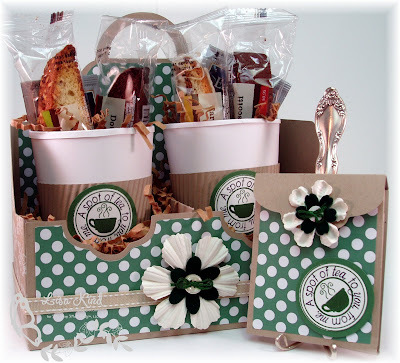 When I was at Starbucks, I purchased a gift card along with the biscotti. I used the previously released Time for Tea Bag cut file to present it in and decorated it in a similar fashion. I also added some tea bags in there. Whew! That was quite a post! So what do you think? Are you ready for more peeks? Lauren, Catherine, Tracey, and Tammy are posting their peeks today. AND we have our newest DT member, my friend, Tangii Crain, posting today too. 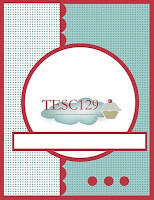 We also have our first guest designer this month, Debbie Marcinkiewicz, and she has something to share today as well! So stop by and give them some love and check out more of the new release! Thanks for sticking by me for this long post! I'll be back on Friday for our group post, which is the official day of the release, but keep checking Lauren's blog for more updates! Happy Sunday! Today, my niece Maria is making her confirmation and I am her sponsor. I wanted to make her a special card, of course. I bought her a cross charm for her Pandora bracelet, so I needed a little package to present it in. 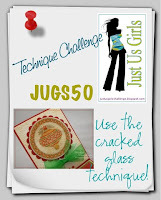 Luckily, this week's JUGs challenge is a template challenge, and we used My Time Made Easy's Tuck-ered Out template. It was a perfect fit for the little Pandora box. Maria loves green, so I tried to incorporate that as much as possible. I used the retired dp from SU called Afternoon Tea for the box, which has some pretty Wild Wasabi green in it. I paired it with a pretty ribbon from Michael's. I chose to use SU's retired set Symbols of Salvation and Taylored Expressions sketch for her card. The dp coordinates with SU's Soft Sky and Wild Wasabi colors. I ran the wasabi piece through a Sizzix folder and used a piece of Soft Sky for the scallops. I had a difficult time trying to find a senitment for the occasion, but found this great one in PTI's Year of Flowers: Sweet Peas set. I made it into a banner and swirled some Soft Sky ink around it. I love this new Spellbinder's die and how it looks with the Soft Sky ink swirled around it while the paper was still in the die. It looks so dainly and like a doily. The image is colored with copics on the new X-press It Blending cardstock from Copic. The colors apply like a dream on it! I finished it off with some green bling. You can check out these little boxes on the JUGs blog and you can purchase them at My Time Made Easy. 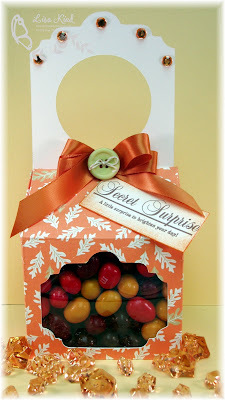 Sneaks for the MTME October release start on Wednesday, and I'll have a fabulously delicious project to share with you! Thanks for stopping in today! Hello everyone! Just Us Girls is having a template challenge today sponsored by My Time Made Easy. We are all using the uber-cute Tuck-ered Out template. I didn't realize how petite it was...Lauren's templates are usually a very generous size, but this one is just so cute in it's miniature size. I was sort of in a Halloween mood, so I went with that theme. Is this not adorable? 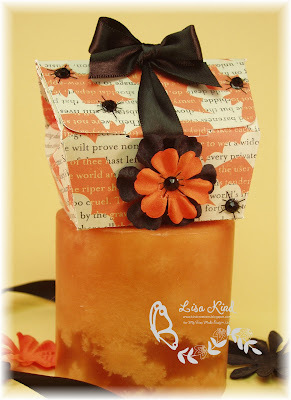 You could acutally pack a lot of candy corn inside this little cutie! (Yum!) I just picked up this cool paper from my LSS. It's from The Girls' Paperie and it's appropriately called Toil and Trouble. After cutting the template out using SCAL and Cricut and then assembling it, I added the black satin bow and flowers. In the center of the flower, and crawling all over this little box, are some crystal spiders from Memory Box. So cute! This template went together so quickly, too! Gotta love that! You can stop by the JUGs blog to see all the wonderful projects the girls have created. There are some fantastic things there! Now, some MTME news: You should check out DT member Catherine Doucette's blog. She is showing projects using the new Spooky Surprise stamp set that you can pre-order or download now in digi format. You can see the set and read how to get the it on Lauren's blog. The rest of the DT will start sneaking the new October release on Wednesday. On another note....Lauren's daughter Alexa is in the hospital with pneumonia. They anticipate that she will be there for about two weeks. You can read more about it on Lauren's blog. On top of all that, Lauren has been diagnosed with pneumonia as well. So any positive thoughts or prayers are welcome. 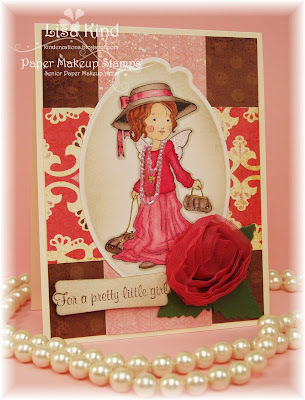 Paper Makeup Stamps has a fabulous kit which was released this month called Arelia's World of Make Believe. Here's what is in the kit. I used the wordart in this card last week, and today I'm using the beautiful Arelia fairy and sentiment, which are only available in the kit! Isn't she just adorable? I was so excited when I saw this kit! That flower is part of a string of them...I just cut it apart and added some leaves. I used liquid pearls on her string of pearls. It was my first time using it and it sort of globbed a little! It was the last thing I added, of course! But I think it looks ok. She's colored with copics on the new X-Press copic paper. It's a little thin, but I love coloring on it! I used this week's Sweet Sunday Sketch, too. 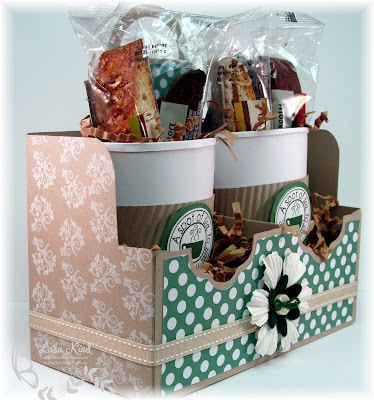 Stop by the PMS blog to see more of this kit. Sorry for such a short post, but I'm not feeling well and I need some sleep! Thanks for stopping by! Happy Monday everyone! Is that an oxymoron? Is there such a thing as a "Happy Monday"? Well, for the Paper Makeup Stamps and Quixotic Paperie DT it is! We are combining forces for the first time ever. Quixotic Paperie is the only supplier of Paper Makeup Stamps in Europe, so we thought we'd get together to show off our beautiful stamps! I'm using two of my favorite sets: Faith Hope Love and Little Moments. I went to a class on Saturday at my LSS. The instructor was Wendy Vecchi from Ranger Industries. She taught us various techniques using Ranger distress and pigment inks. This one was one of my favorites which she called Ghosting/Faux Bleaching. 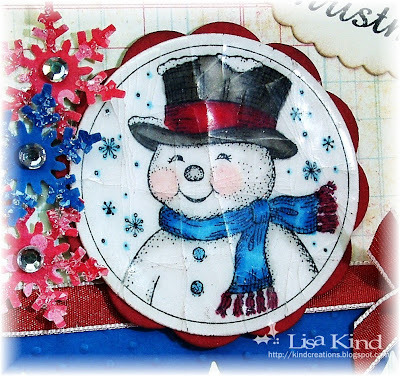 I stamped this beautiful stamp in their Snow Cap white pigment ink and stamped it on the paper. I heat set it until it was dry, then used the sponge applicator to apply Spiced Marmalade and Tea Dye distress inks. The more color you apply, the better the image shows up. I did the sponging while the paper was still in the die. The dp is Basic Grey's Ambrosia. I saw a card on Karen Giron's blog that gave me the inspiration to use up some of my scraps of this dp. I can't remember where I got those orange discs...they were sent to me when I was guesting on the Color Throwdown. The ribbon is SU's basic gray taffeta and I used the Bow Easy to create my double bow. 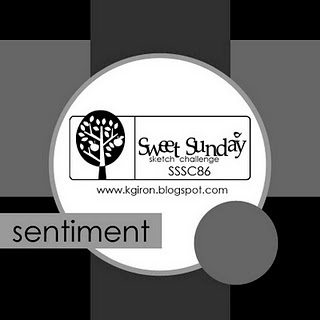 I stamped the sentiment from Little Moments in Memento tuxedo black. I have a list of the participants in this hop below for you to check out. Hope you are enjoying hopping with these two countries! Thanks for stopping by! Happy Saturday! Just Us Girls has issued a fab color challenge which Kathryn put together. Red, green, black, and a neutral color. When I saw these colors, I thought I would create a Christmas card, but then I remembered that today is my in-laws 56th wedding anniversary. My next thought was to use some Graphic 45 paper I knew I had in my stash. So this is what I came up with. The Graphic 45 papers I used are from the Botanicabella and Fashionista collections, and the sentiment is from Verve's Wishing You sentiment set. 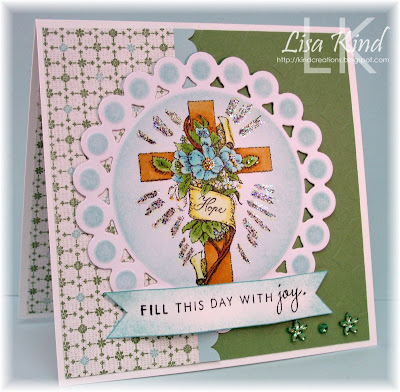 I swirled some distress inks around the sentiment while it was still in the die and then added some green pearls. I used one of the new dies for the circle (can't remember the name of it!) and SU's scallop border punch on the black dp. The ribbon was part of a gift I received from my PMS fellow design team member, Bonnie Sharp. 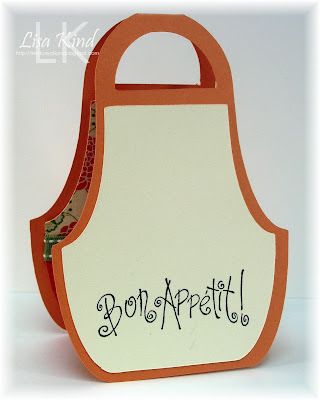 It's from Sharon Johnson's Stamp Simply Ribbon Store, and it's so lucious! It hurt to cut into it cause I just want to hoard it! But it was the perfect color for my card. I used a Bow Easy to make my double bow. I used Mercy Kerin's Tuesday Sketch from this week. It was perfect for my card. 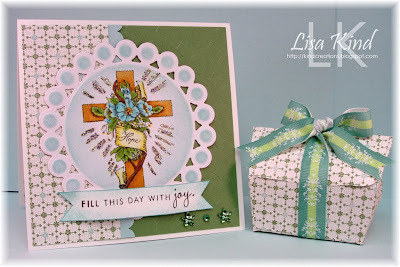 Now you have to stop by the JUGs blog and see the girls' cards using these colors. They are amazing once again! 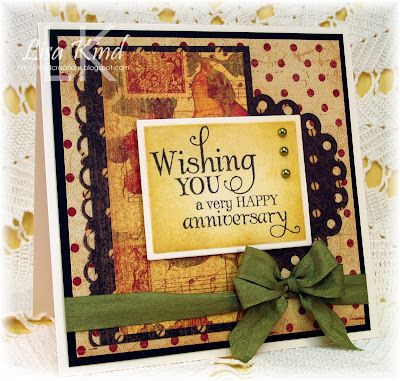 We also have Lynn Mangan as our Guest Designer this month, and she has been creating some beautiful cards for you to see! Happy Hump Day! 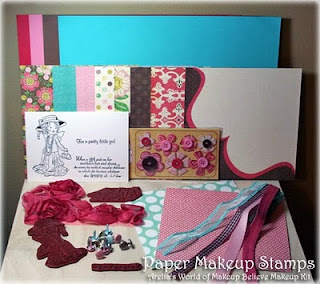 Paper Makeup Stamps has a new kit this month called Arelia's World of Make Believe. It's my favorite kit so far and here's what's included in it. 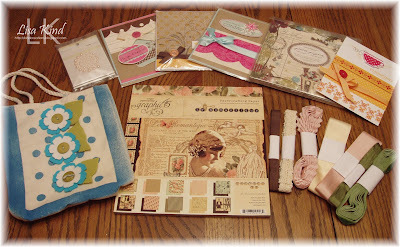 The papers are fabulous, the fairy, sentiment and wordart are beautiful, and the embellishments are amazing! I just adore the colors Katie chose for this kit. 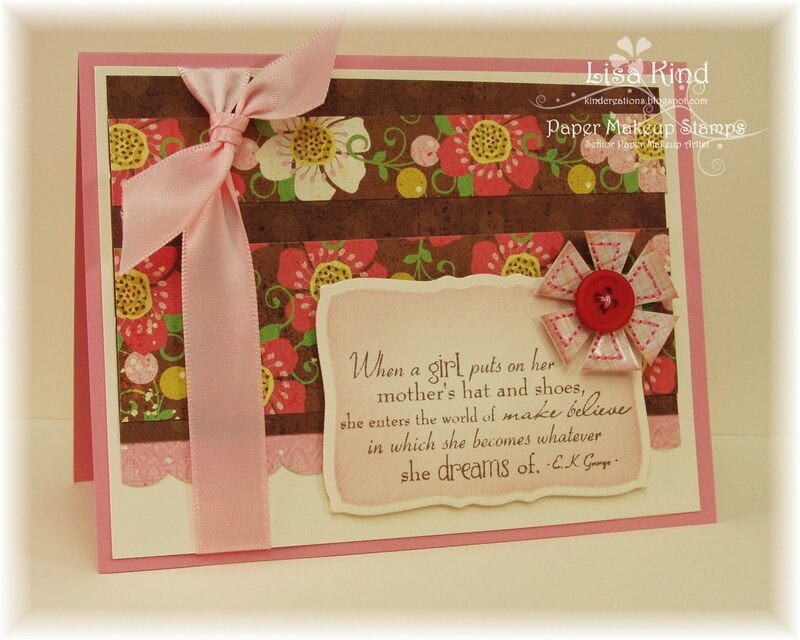 Pink and brown is one of my favorite color combinations, so that's what I decided to use in my card. I started with this week's Mojo Monday sketch, but diverted too much from it to say I used the sketch! But it did give me a great starting point. The colors and pattern in the floral dp is so pretty and I love the flower embellishment. There are several different styles and sizes of them in the kit, and are really fun! 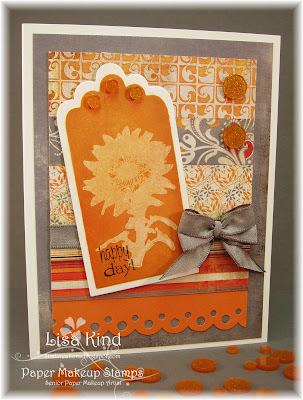 I just love the way this card came out and I pulled it together so quickly...a feat for me! The kit made it so easy ot pull together. 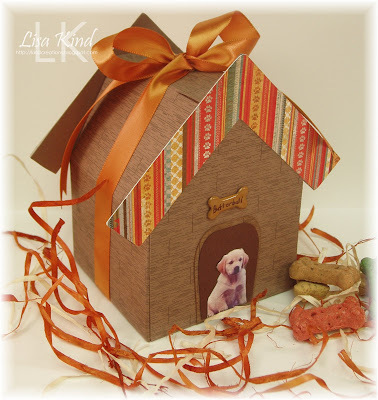 Stop by the PMS blog and see what the others have done with this kit. I'll have another using the Arelia fairy soon. Thanks for stopping by! A while ago, Paper Makeup Stamps added a few more designers, so we decided to do a Secret Admirer exchange to get to know everyone better and welcome them to our family. We made a couple of cards and an altered item along with some other personalized gifts to send to our secret DT member. Look what I received from my secret DT, Bonnie Sharp. Of all the fab things in the box, I was immediately drawn to the ribbons. They are from Sharon Johnson's store and I was going to order some when this came in the mail! They are amazing! And all the paper and cards are beautiful. And that flower bag? So cute and it contained 3 packages of different Reese candy! Notice the past tense of contain? I ate one bag almost immediately, and the other two were taken to my classroom where I proceeded to eat another bag and I'm well on my way to eating the third! Hahaha!!! Thank you so much Bonnie! I love the gift! I had Stephanie Zito as my secret DT member. She was so easy to create for because she just got a new puppy named Butterball. She also loves to cook, so I had another theme to work with. 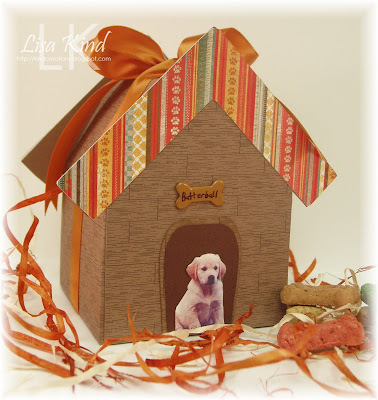 For Butterball, I created a doghouse using My Time Made Easy's Welcome Home template. 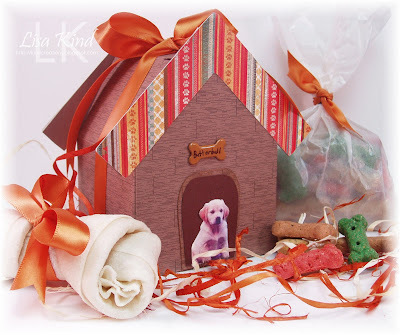 I reduced the template to 75% and cut off the chimney to create this cute dog house. I printed the Custom Construction Materials Color Me Pretty paper onto close to cocoa paper. The door to the house was created with the Home Improvement Coordinating Cuts cut file and was cut down to make it smaller. The roof panels were created using Basic Grey's Max and Whiskers dp. Love the colors and the puppy prints. These were the treats that were for Butterball. The bad of treats fit in the dog house, but the bone was a bit too big. Isn't that little puppy just so adorable? 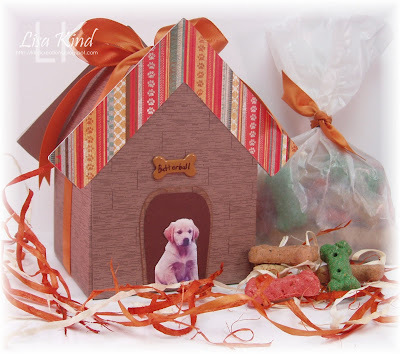 I snagged this picture from Stephanie's blog and added the bone brad, personalized with Butterball's name. 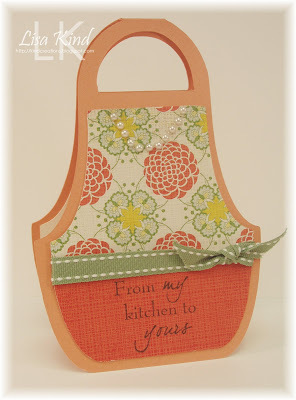 Now for Stephanie, I created this card using MTME's Gardener's Apron. 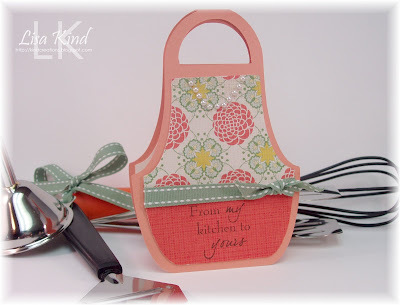 I used Basic Grey's Nook and Pantry dp for this pretty little apron. I added the pearls to make it much more feminine. Here's the inside. And she said she loves kitchen gadgets, so I purchased a few and strung them together. I also got her a pack of the Nook and Pantry dp. I wanted to get the Max and Whiskers dp, but my LSS was out of it! Darn the luck! And guess what candy she said she likes too? You guessed it! Resse peanut butter cups! So she got some of those too! I had so much fun creating this gift for Stephanie! And I loved my gift from Bonnie! My two new Canadian friends! Thanks girls! Hi everyone! I totally forgot about a card I had to post today for Paper Makeup Stamps. How could I forget my fav stamps? Must be that I'm back at my teaching job and I'm on overload! Anyway, I have one of the cute Retro Cutie Critters named Drummer the Bear to share with you. This picture does not do the card justice! The colors are so warm in person...they look very harsh to me here. Anyway, I used Basic Grey's Oliver dp as my inspiration along with the Sweet Sunday Sketch but flipped it. I used the warm colors in the paper to color Drummer. I also used something new to me....Copic's new Xpress paper. My friend, Cheryl Rowley, ordered hers from Australia and sent me some sheets (she's so sweet...thanks Cheryl!)! I quickly colored the image and loved how the ink stayed on the paper. I have trouble with bleeding sometimes, especially with red. But I had no trouble with that and the blending of colors was so nice. Love this paper! 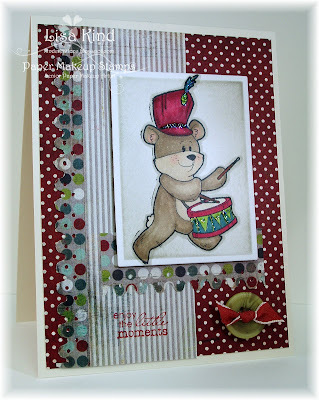 So I paired Drummer a sentiment from another new set from PMS called Little Moments. 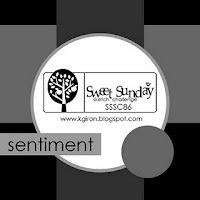 It's such a great set with sentiments for every occasion...a total go to set. 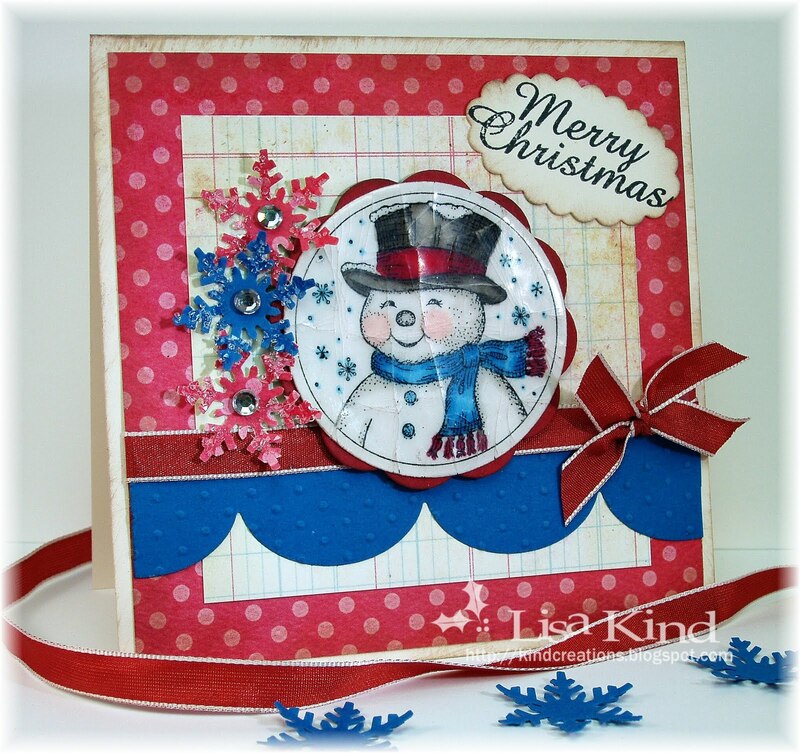 Stop by the PMS blog to see the other great creations from the PMS DT. Thanks for stopping in today. Have a great weekend! Makes you want to enter, right? And you can't win if you don't play! So stop by the JUGs blog to enter your creation and then stop by the personal blogs of the JUGs DT to read about their cards and leave some love! Thanks for stopping by! MTME Release Day and Blog Hop!